Don’t forget to take a look at the Archives Display Cabinet as you head over the bridge to the Auditorium or Brookside elevators. Every two months there’s a completely new display theme which includes documents and photos from the Archives. The current Archives display, Staying Fit at Charlestown Is Easy Peasy, has documents and photos of the 35-year history of our Pool and Fitness Centers and fitness classes. See photos of classes including the resident-run morning exercise class which began 35 years ago. 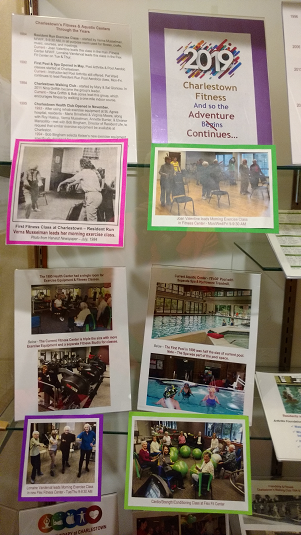 This display demonstrates the many fun and effective ways available to residents to stay fit at Charlestown. Check out the new Charlestown Fitness Song. Write your own verse for the song and email or bring it to the Archives, across from the pharmacy on Main Street in Fountain Hill [Bldg. 1]. Warning: Daily exercise and healthy eating leads to increased awesomeness! !